Early planting favors higher yields, but does not guarantee higher yields. Statewide averages for planting date and yield are not strongly related. Planting date is but one of many yield influencing factors. onventional wisdom says that the prime planting "window" to maximize corn yields in much of Indiana opens about April 20 and closes about May 10. This "window" typically opens about one week later across the northern tier of Indiana counties (later warmup) and about one week earlier across the southern tier of Indiana counties (earlier warmup). Recent rains, and SNOW, across Indiana, plus the forecast for even more rain, threaten to delay the start of the 2019 corn planting season. Mark my words, the fearmongers and pessimists among us will soon begin to worry about the consequences of a delayed planting season and the risk that imposes on the crop's yield potential in 2019. But, hold on... How absolute are the negative consequences of late planted corn? How accurately does planting date predict statewide corn yield anyway? Does late planting in and of itself guarantee lower than normal yields? Good questions, but the effect of planting date on statewide average corn yield is simply not clearcut. 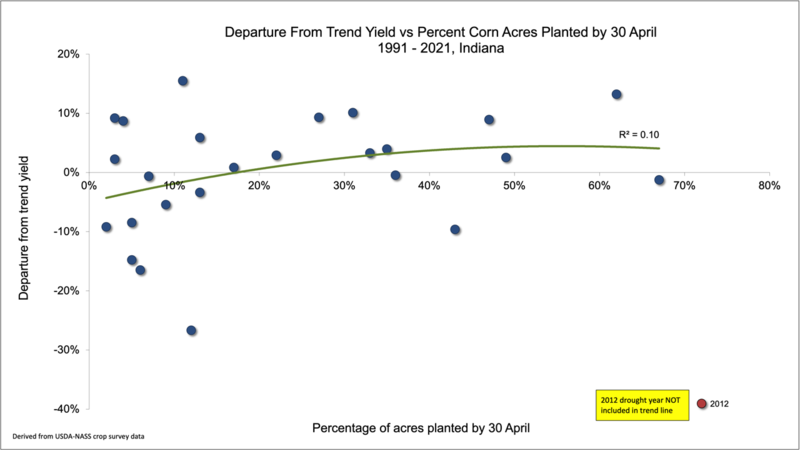 If one reviews USDA-NASS crop progress reports for the past 25 years (USDA-NASS, 2019), there is NOT a strong relationship between planting date and absolute yield or departure from trend yield on a statewide basis for Indiana. 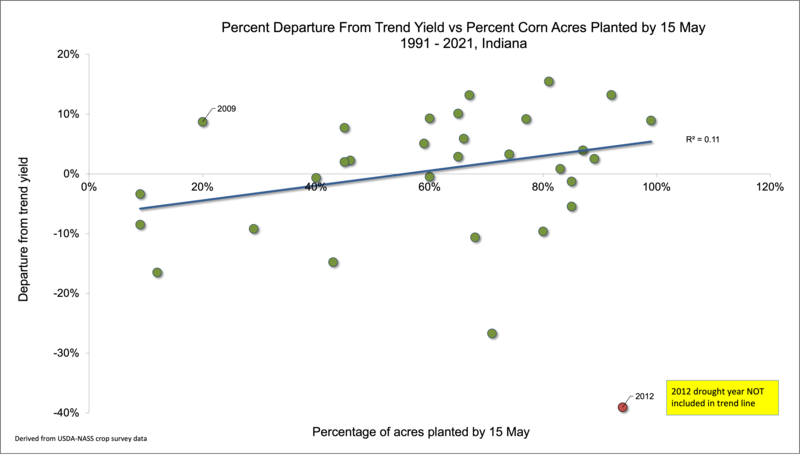 Figures 1 and 2 illustrate the relationships between the departure from statewide trend yield and two measures of statewide planting progress; percent of total corn acres planted by April 30 or by May 15. Even though mathematical relationships, or "trend lines", can be discerned, they only account for 12 to 16% of the variability in trend yield departures from year to year, respectively. In other words, a number of Yield Influencing Factors in addition to planting date also affect yield for any given year. Why is it that every corn agronomist worth their salt preaches about the importance of timely planting and yet the statewide statistical data suggest that planting date accounts for only 12 to 16% of the variability in statewide yields from year to year? Let's look more closely at this apparent conundrum. It is true that RELATIVE grain yield potential of corn declines with delayed planting after about May 1 (Myers & Wiebold, 2013, Nafziger, 2008; Nafziger, 2011). Estimated yield loss per day with delayed planting varies from about 0.3% per day early in May to about 1% per day by the end of May. RELATIVE YIELD POTENTIAL goes down with delayed planting because of a number of factors, including a shorter growing season, greater insect & disease pressure, and higher risk of hot, dry conditions during pollination. In other words, if all the other yield influencing factors work together to determine that the maximum possible yield this year for the optimum planting date is 220 bu/ac, then the consequence of a 10-day planting delay beyond April 30 (at 0.3% decrease per day) would be a yield potential of about 213 bu/ac (i.e., 220 bushel potential minus [10 days x 0.3%] due to delayed planting). However, if all the other yield influencing factors work together to determine that the maximum possible yield this year for the optimum planting date is only 150 bu/ac, then the consequence of a 10-day planting delay beyond May 1 (at 0.3% decrease per day) would be a yield potential of about 146 bu/ac (i.e., 150 bu/ac potential minus [10 days x 0.3%] due to delayed planting). Make sense? Consequently, it is possible for early-planted corn in one year to yield more than, less than, or equal to later-planted corn in another year depending on the exact combination of yield influencing factors for each year. Figure 3 illustrates this confusing concept. In that graph, delayed planting of corn in an otherwise high yielding year (B) may still be higher yielding than a crop planted on the optimum planting date in an otherwise lower yielding year (C). Farmers know this to be true because some have had June-planted crops in recent years that ultimately yielded better than any crop they have ever had.............. because the remainder of the growing season following the delayed planting was extremely favorable for crop growth and development. For example, the crop years 2009 and 2012 represent late and early planting date years respectively in Indiana. About 94% of the state's corn crop was planted by May 15 in 2012, but only 20% of the crop was planted by May 15 of 2009 (Fig. 2). Yet, the earlier planted 2012 crop yielded 38.6% BELOW trend yield for that year and the later planted 2009 crop yielded 9.5% ABOVE trend yield. Why? There were other important differences in yield influencing factors between the years other than simply the planting dates. Let's not succumb quite yet to fearmongering triggered by the potential risk of the 2019 corn crop getting off to a late start. We need only look back to the 2018 planting season for an example of a slow start to the planting season that was followed by a 2-week period in early May in which 60% of the state's corn acreage was planted. "Mudding in" a crop early to avoid planting late will almost always end up being an unwise decision. When faced with prospects of delayed planting, one should certainly look for ways to expedite the planting process by eliminating unnecessary tillage trips or delaying some field operations (Thomison & Culman, 2017) so that you do not plant any later than absolutely necessary. One example of a field operation that can be delayed with little risk of yield loss is to forego pre-plant nitrogen fertilizer applications in favor of sidedressing the crop later. This choice is especially low risk if your planting operation includes 2x2 starter fertilizer at rates no less than 20 lbs/ac of nitrogen. Finally, since delayed planting by itself is no guarantee of lower ABSOLUTE grain yield, I see little reason to change any crop inputs because of delayed planting, other than possibly seeding rates. Significantly delayed planting generally coincides with warmer soil temperatures compared to early planting. Consequently, stand establishment may be more successful with delayed planting, resulting in established plant populations that are closer to actual seeding rates than the usual 90 to 95% success rate with earlier planting dates. So, you might consider slightly reducing your seeding rates with delayed planting. Coulter, Jeff. 2018. Planting Date Considerations for Corn. Univ. Minnesota Extension. https://extension.umn.edu/corn-planting/planting-date-considerations-corn [URL accessed Apr 2019]. Larson, Zachary. 2017. Planting Date, Temperature, Spacing, and Emergence: What Really Matters? Penn. State Univ. Extension. https://extension.psu.edu/planting-date-temperature-spacing-and-emergence-what-really-matters [URL accessed Apr 2019]. Myers, Brent and Bill Wiebold. 2013. Planting Date 2013. Univ of Missouri Extension http://ipm.missouri.edu/IPCM/2013/4/Planting-Date-2013. [URL accessed Apr 2019]. Nafziger, Emerson. 2008. Thinking About Corn Planting Date and Population. The Bulletin (No. 2, Article 7, April 4), Univ. of Illinois Extension. http://http://bulletin.ipm.illinois.edu/article.php?id=890. [URL accessed Apr 2019]. Nafziger, Emerson. 2011. Corn Planting: Optimism on Hold. The Bulletin (No. 3, Article 9, Apr 22), Univ. of Illinois Extension. http://bulletin.ipm.illinois.edu/article.php?id=1469 [URL accessed Apr 2019]. Nafziger, Emerson. 2017. Planting Date for Corn and Soybeans in Illinois. The Bulletin, Univ. of Illinois Extension. http://bulletin.ipm.illinois.edu/?p=3848. [URL accessed Apr 2019]. Nielsen, RL (Bob). 2018. Corn & Soybean Planting Progress in Indiana Over the Years. Corny News Network, Purdue Extension. http://www.kingcorn.org/news/timeless/PlantingPace.html [URL accessed Apr 2019]. Thomison, Peter and Steve Culman. 2017. Corn Management Practices for Later Planting Dates: Changes to Consider. C.O.R.N. Newsletter, Ohio State Extension. https://agcrops.osu.edu/node/2156 [URL accessed Apr 2019]. USDA-NASS. 2019. Crop Progress (archives). USDA, National Agricultural Statistics Service. http://usda.mannlib.cornell.edu/MannUsda/viewDocumentInfo.do?documentID=1048. [URL accessed Apr 2019]. April 30 in Indiana, 1993 - 2018. Data derived from USDA-NASS crop survey data. May 15 in Indiana, 1993 - 2018. Data derived from USDA-NASS crop survey data. crop in one year (B) can yield better than a crop planted on the optimum date in another year (C).